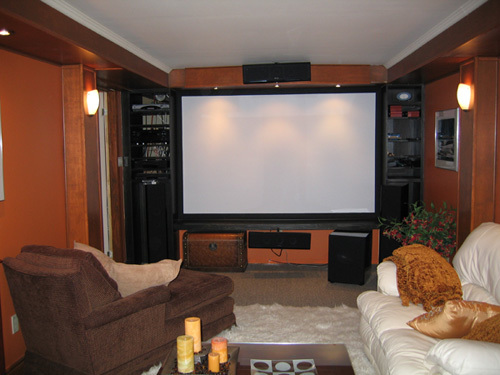 If the center channel is on top of a big TV, it may be well above the height of the seating area, so get a couple of rubber doorstops (one Axiom owner used hockey pucks) and wedge them under the speaker base at the rear so the front of the speaker fires directly towards the listening area. Axiom’s center channels have broad horizontal dispersion, but it’s always a help to have the speaker aimed toward the listeners. And if your center speaker is on a shelf beneath the TV, angle it upwards towards the seating area. In large movie theaters the center channel is behind the center of the screen and carefully horn-loaded to direct the dialogue over a broad horizontal angle and a narrow vertical one, to avoid sound bouncing off the ceiling, which can inhibit clarity. Likewise don’t position a center channel more than 18 inches above the TV display or recess it in any way on a shelf in an entertainment unit. Move it forward and angle it downwards.